Curiosity may have drawn audiences in 1965 to see what had become of stars like Rory Calhoun, Corinne Calvet, Lon Chaney Jr, Richard Arlen and Johnny Mack Brown. 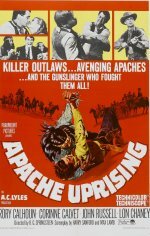 Also of interest are the veteran players John Russell, Gene Evans, Arthur Hunnicutt, Jean Parker and Don "Red" Barry that producer AC Lyles assembled for this western. John Russell makes an excellent deep-dyed villain, and DeForest Kelley also scores as a paranoid henchman, but it would be kinder to catch the others when they were in their prime.